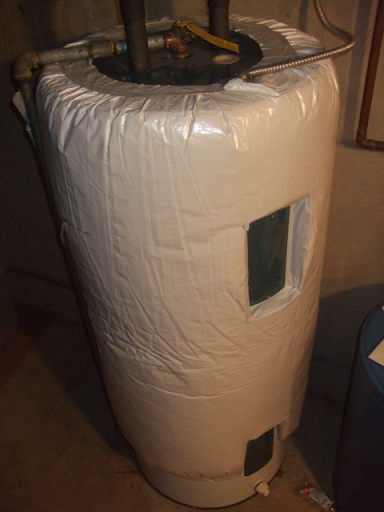 In preparation for winter I installed insulation on most of my hot water pipes and wrapped my water heater in an insulating blanket. My house has both copper and steel pipes, in three different sizes, with many right angles and T connections, so it took a few trips to the hardware store before I had all the pipe insulation bits that I needed. I chose the kind of pipe insulation pre-cut lengthwise, with sticky to close the seam, because it was easy to install. And indeed it was easy to install. For pipes in tight spaces, it is possible to cleave the seam of the insulation while feeding the lengthening insulation into the difficult location. For right angles and T connections, buy an insulator which is one size bigger than the rest of the pipes. The picture shows the first couple inches of pipe insulation. Common advice is to do a minimum of the first four feet closest to the hot water tank, because that is where heat is lost most and most often. I insulated pretty much as far as I could trace the pipes until they were lost inside the drop ceiling, which was between three and ten meters depending on the pipe. I have a large, 65-gallon electric hot water heater. I bought a large-size water heater blanket, which is what they call the purpose-sized rectangular plastic-backed fiber-glass insulation. The packaging suggested that a typical installation includes cutting the blanket but it was the perfect size for mine. It came with about four feet of a perfect variety of tape: several inches wide, thin white plastic tape which stuck very well to the lining of the insulation. I used that tape to seal the vertical seam up the side of the water heater. No hardware store stocked more of that tape, so I used white duct tape to finish the rest of the edges. The water heater tank has two control panels, one for each thermostat, so I cut out around each one and taped the edges. According to the directions, the blanket should not reach to the bottom of the tank, which was good because the one I bought was only as long as shown in the picture.